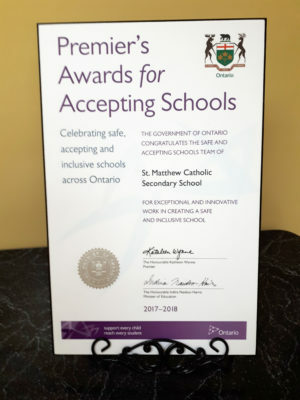 In June 2018, St. Matthew Catholic Secondary School in Cornwall was one of ten schools from across the province to be awarded the Premier’s Award for Accepting Schools. The award recognizes school teams that have done exceptional and innovative work in creating a safe, inclusive and accepting school environment. St. Matthew is a secondary school that has a focus on supporting students’ academic and mental health needs. Students often have to break down barriers to their education at a young age and many struggle with anxiety and mental health issues. To meet the learning needs and ensure the academic success of their students, the school has adopted a strategy which outlines a unique learning profile. This approach is reinforced with various programs to help support the learning journey. St. Matthew Principal Joy Martel, Vice-Principal Andrew Lovett, Student Support Worker Kim Blanchet, and student Tyler Luchuk presented information to the Board about the award, and the programs the school provides to students. At the school, students are encouraged to take on leadership roles. These skills can then transfer to other areas of their life, with the goal of becoming caring, contributing and committed members of their community. The One Caring Adult initiative at the school ensures that students are connected to a staff member who helps support the student by building close connections and making sure they feel supported. The staff member takes the time to review timetables, help to arrange community service hours for graduation, and by showing genuine concern for the student’s well-being academically and personally. 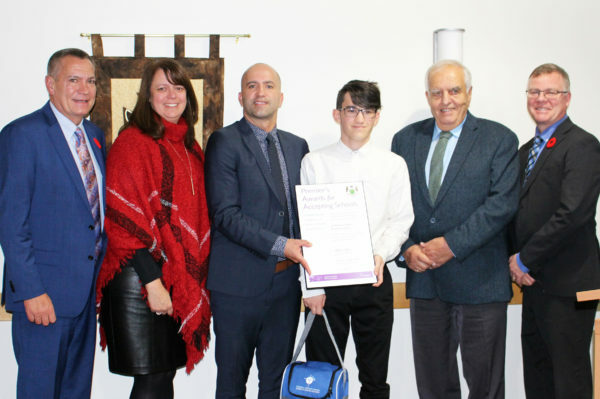 The CCC (Connected, Committed, Contributing) Project is another initiative which began four years ago to create an intensive support system for students in care. The program is enhanced by a partnership with CAS, and through a designated lead teacher, the support system works to build relationships between students and staff with a focus on goal setting, credit progress, and graduation success rates. The program also provides the opportunity to screen students for at-risk concerns and mental health needs, to ensure that immediate care and support is provided through community partners. Passport to success is another program which helps to provide support for students in credit completion. During Credit Rescue Week, staff work with students to try and get all credits completed for the semester. This program has helped to recover 74 credits to date. Tyler Luchuk, a student at St. Matthew, who has struggled with anxiety and depression, spoke to the Board about his experience. “Thank you Tyler for making this presentation tonight. We appreciate you sharing your story with us, it has been inspirational, and it is wonderful for us to hear how you have benefitted from this program,” noted Vice-Chair Ron Eamer.